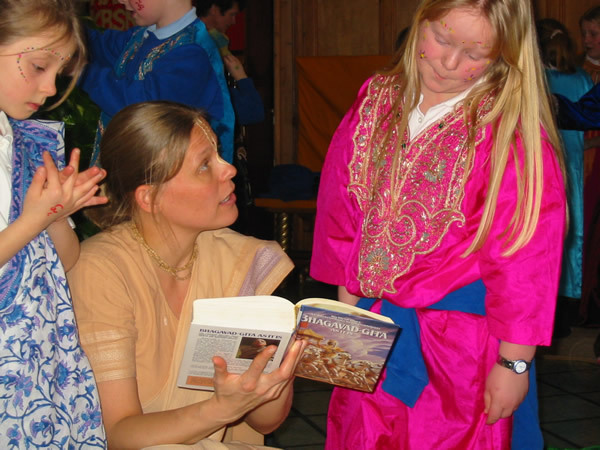 We offer presentations to Primary and Secondary Schools, Colleges and Universities both from the general Hindu perspective and from within that, our particular tradition of Vaishnavism. Consider a temple visit for an opportunity to experience first hand an authentic Hindu shrine, observe worship and enjoy a traditionally cooked and served, delicious vegetarian lunch. INSET training is offered to teachers and trainee teachers who strive to make teaching Hinduism interesting, rewarding and effective. Please explore this page to find out more details of our individually tailored, interactive and experiential services, our service charges and how to find us. We have also included comments from both teachers and students about our previous workshops, temple visits and sixth form conferences. If you’re looking for resource packs for RE teachers, story books, or artefacts our gift shop will be able to assist you. Thank you for your interest, we look forward to being of service to you.